This week, the US Federal Reserve announced no change to its interest rate policy. In the process, it apologised (in Fed-speak) for freaking everybody out at the end of 2018, unveiling a softer shift in its policy approach. I’ll admit I’m stealing this comparison from someone else (Bloomberg’s John Authers), but it’s a good one. Some further gradual increases in the target range for the Fed funds rate will be consistent with sustained expansion of economic activity, strong labor market conditions, and inflation near the Committee’s symmetric two percent objective. In light of global economic and financial developments and muted inflation pressures, the Committee will be patient as it determines what future adjustments to the target range for the federal funds rate may be appropriate. It’s worth mentioning that Fed statements are very formulaic and every change is pored over by analysts. What’s happened to the Fed’s interest rate policy? Basically, the Fed is unlikely to be hiking rates for a while – unless of course, the data changes significantly. 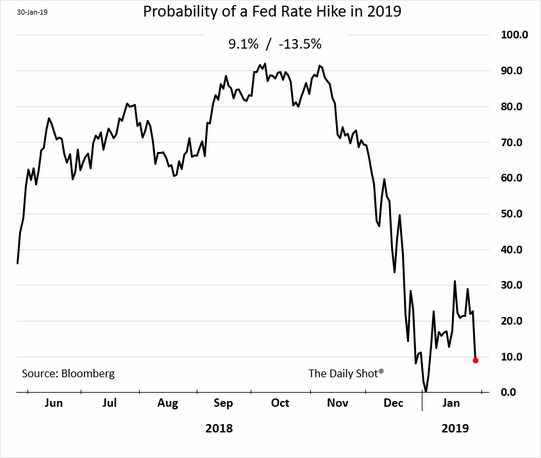 The chart below shows the probability of a Fed hike in 2019 – now at 10% compared with 90% in mid-November. In fairness, you could say the market was already pricing in this outcome, but I guess it’s always nice to see it confirmed. Fed Chair Powell managed to strike a balance between a soft message on its rate policy, whilst still delivering a generally positive message on the overall state of the US economy. What is the Fed Put? Powell was fairly explicit, maybe unintentionally, about the Fed Put. The Fed Put is the idea that if market volatility picks up, at some point the Fed will step in. That sort of mindset can encourage bad behaviour (taking excessive risk assuming you’re protected). But how does it work in practice? One indicator that gets a lot of attention (including from the Fed) is the so-called Financial Conditions Index. As the name suggests, it tracks a range of indicators to assess whether or not financial conditions are tight or loose. The basic idea is that interest rates aren’t the only measure for how much liquidity there is in the system. There’s one particular problem with the FCI – it includes things like equities and fixed income markets. So when markets fall the FCI tightens, which in theory could encourage the Fed to cut rates to support markets. And in the short-term, that line of argument seems to have some merit. The chart below shows FCI vs the S&P 500. It’s only a few months, but it gives you an idea. Is focusing on FCI a good idea? It’s unclear, it could lead the Fed to focus on the wrong variables. But in the short/medium term, a Fed Put is probably good for risky assets. The financial markets reacted as you would expect.Short-dated treasury yields fell, the dollar weakened against the Euro and equities rallied. 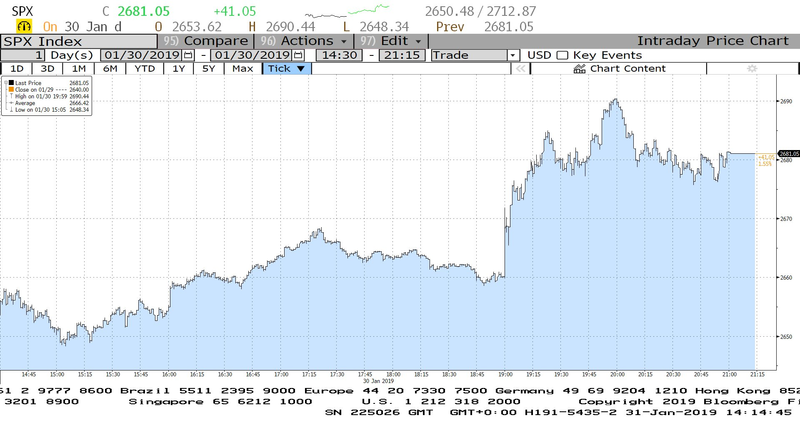 The chart below shows the intra-day moves of the S&P 500 yesterday. Pretty clear when the statement came out. We’ve already seen a rally in equities in January, partly on the expectation that the Fed would step of it’s aggressive programme of rate hikes. So the short-term reaction could be quite muted. And the Fed’s justified concerns about global uncertainty will worry some people, especially those who are already worried, so it’s worth keeping a close eye on corporate earnings. But one concern of markets in December was that the Fed was somehow hell-bent on raising rates come what may. And that risk seems to have been removed. It’s not the only driver for markets, but yesterday’s news should help support risky assets. 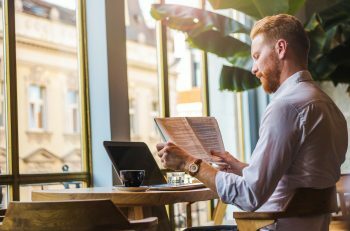 Our Investment Consultants are here to talk you through every part of your investment journey – whether you have questions about investment advice, Moneyfarm products, or the the decision-making behind our fully-managed portfolios. Technology makes our investment advice cost-efficient; our Investment Consultants make our service work for you. Book a call today or visit the Moneyfarm website.